02 Mar 2017 --- Fruit d’Or is set to demonstrate its’ dynamic women’s health formulation called GO2, a drink that blends its’ non-GMO organic cranberry juice powder with three other science-based ingredients, including Taiyo’s Sunfiber. With low sugar and calories, the drink will target the women’s health category, but also has gut health and digestive care on its radar. “This synergistic cranberry-flavored blend combines four science-based ingredients for optimal gut health and urinary tract support,” says Stephen Lukawski, director of sales and business development for Fruit D’Or Nutraceuticals. The ingredients are: 10 grams of Fruit d’Or organic cranberry juice powder, 6 grams of Sunfiber, 2 billion CFUs of LactoCran, a cranberry protein powder/probiotics formulation, which contains Bacillus coagulans MTCC 5856, a probiotic strain from Sabinsa that has 200 percent more activity growth when combined with the cranberry than FOS, and PreticX, AIDP’s slightly sweet prebiotic shown in clinical studies to significantly increase the proliferation of bifidobacterium in both low and high doses. Click to EnlargeThe product also utilizes the technology of “Güd Pod”, a which makes refreshing smoothie-type drink which is ideal for active women on the go. “We’re introducing a new formula concept that doesn’t exist in the market using an innovative delivery system also new to the industry,” says Lukawski. “Unlike other commercially available cranberry juices which contain as much as 63 percent sugar water, Fruit d’Or’s organic cranberry juice powder gives women control over the amount and type of sweetener they choose to add,” he adds. “Many of the industry’s top formulators are approaching Fruit d’Or to collaborate on blends using our organic cranberry juice powder,” says Lukawski. The company states that its organic cranberry juice powder offers numerous advantages, including the fact that is carrier-free, meaning no MgOH or maltodextrin, that it is low in calories as it contains no added sugars, and that it is standardized to contain up to 150mg polyphenols. 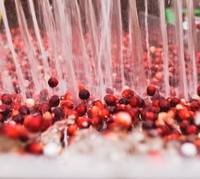 It adds that proprietary breakthrough technology enables the cranberry juice to be free flowing and encapsulated into stick packs, capsules, sachets - without the need for flow agents or other additives. Lastly, it states that it also contains a minimum of 50mg of PACs in a 10 gram serving, 40% more PACs than cranberry cocktail juice and more than 70 percent of juice concentrate than other cranberry juice powders. Lukawski explains to NutritionInsight how although this standardization of biomarkers, such as soluble and insoluble PACs is the industry’s biggest challenge, regulated PAC content is also a big opportunity for the company. Lukawski discusses the health claims behind the product, noting how they are supported by scientific evidence. “The organic cranberry juice was tested at Rutgers University, showing encouraging results of anti-adhesion activity for urinary tract health,” he says. Lukawski explains how Taiyo’s Sunfiber adds a unique edge to the product.